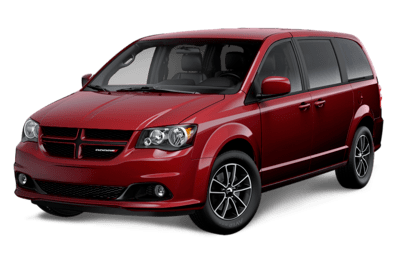 The Grand Caravan's bold look perfectly matches its versatility. 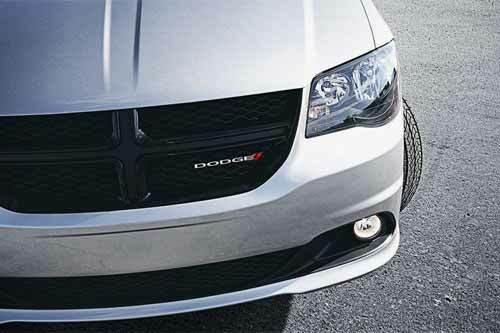 Its purposeful look starts at the front - with signature chrome grille, aggressive front bumper cover and sculpted headlights. As you move rearward, the refined design features a liftgate spoiler and stylish tail lights. The Grand Caravan’s style starts with its boldly sculpted Quad Halogen Headlamps and available fog lamps that help you see any obstacles for extra safety. On the back end, the tail lamps also come with aggressive styling and are equipped with LED lights. 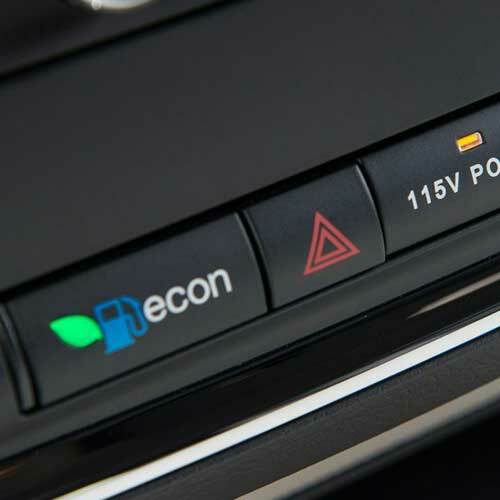 With just the touch of a button on the overhead console, or on key fob, people of all ages and sizes can easily and safely activate the power liftgate to open or close it. 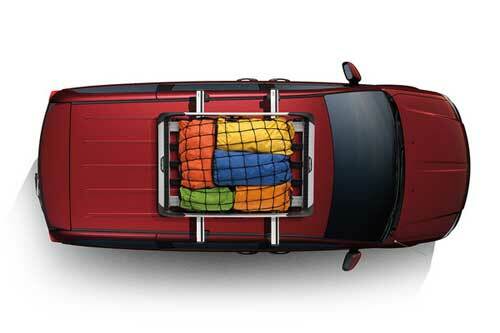 It makes loading up the trunk with your arms loaded with bags and boxes much easier and more convenient. The power liftgate comes standard on the Grand Caravan Crew Plus and GT, and is available on SXT, SXT Premium Plus and Crew with the Power Convenience Group. 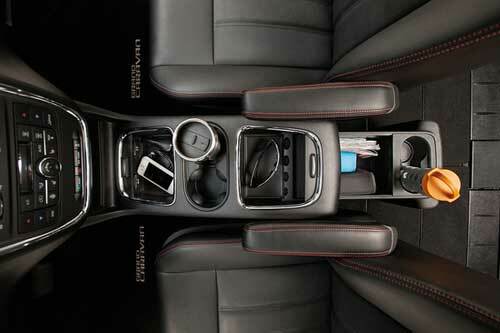 To add even more flexibility for storage, the Grand Caravan engineering team went for over-the-top functionality. You can easily store larger, longer or bulkier items that you can’t fit inside using the Stow ‘n Place Roof Rack. If you aren’t using it, you can stow the crossbars in the side rails to reduce aerodynamic drag for lower wind noise and better fuel efficiency. 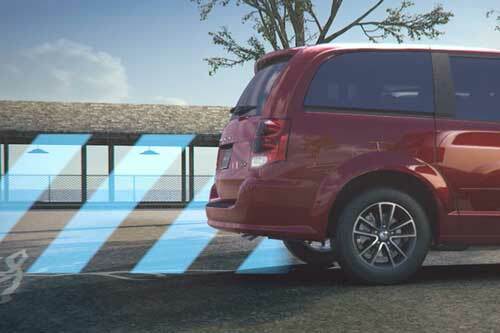 Similar to the Power Liftgate, the power sliding doors in the Dodge Caravan can be activated by a button in the vehicle or on your key fob. It allows for safe and easy use for people of any size or strength, so you never have to worry about the door being closed on someone’s hands or feet. For added comfort and style, you will enjoy the deep-tinted sunscreen glass that blocks some of the heat from the sunlight from all passengers. 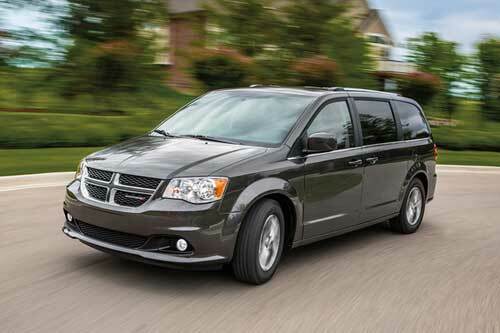 Regardless of where your travels take you, in the Dodge Grand Caravan you travel in comfort and convenience. The interior comes with plenty of space for everyone in your family to sit comfortably, while the materials create plush surroundings for added enjoyment. It also comes loaded with plenty of useful and convenient features that give you greater flexibility for how you use the vehicle for any kind of trip. The Grand Caravan has been the best-selling minivan in Canada for over 34 years, and one of the major reasons why is the flexibility you get for carrying passengers or cargo. 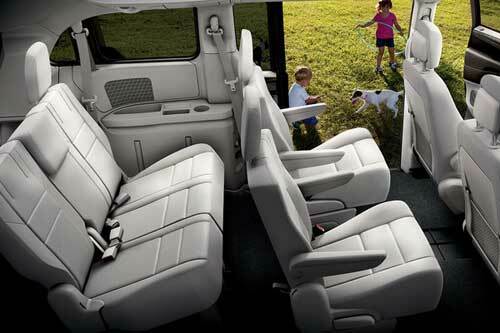 The Grand Caravan features has up to 81 possible interior configurations, with adjustable seating for up to seven people and tons of customizable storage features. 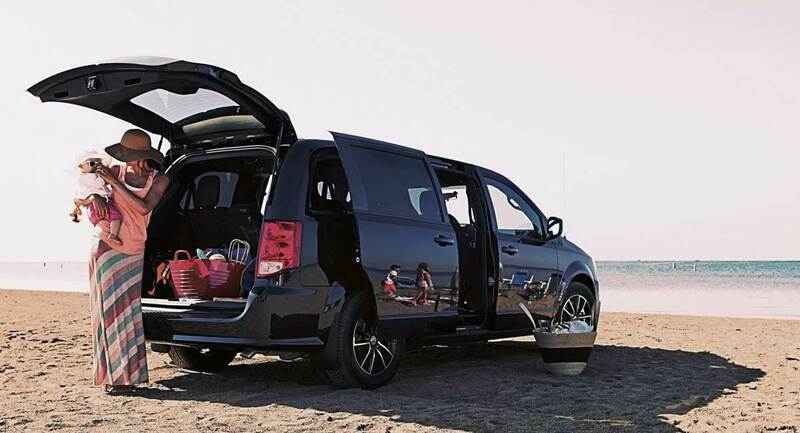 Other features like the Class-Exclusive Super Console, power liftgate and power dual sliding doors are available to make the Grand Caravan even more comfortable and convenient. While the Grand Caravan has seating for up to seven passengers, you can collapse and store the second or back rows of seating without removing them to create more storage space — the 2nd-row Super Stow 'n Go® seats come as standard on most Grand Caravan models, as do 3rd-row Stow 'n Go seats. p>The Grand Caravan also comes with Class-Exclusive tailgate seating, so you can flip the back row of seating to face rearward. If you always need more storage for your coffee, phone, sunglasses, and other items you always want close at hand, you get plenty of storage in the Grand Caravan’s Class-Exclusive Super Console. It offers both the driver, front seat passenger, and 2nd-row passengers access to as many storage containers as your family could need. The Super Console also comes with a stylish touch, as you can choose to cover the area with stylish tambour doors. All Canadian families know how cold vehicles can get in the winter. 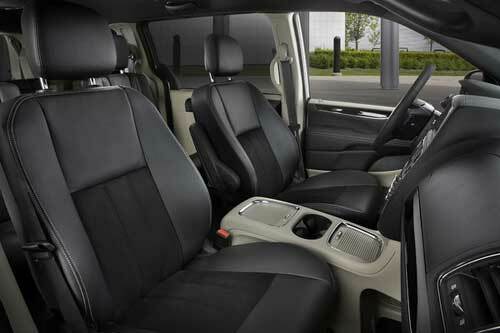 That’s why the Grand Caravan features available heated front seats as well as leather-wrapped heated steering wheel. It helps keep the driver and front passenger warm and comfortable during all their winter journeys. In the Grand Caravan models that have available remote start activation, the heated steering wheel turns on automatically when outside temperatures drop below approximately 4°C (40°F). 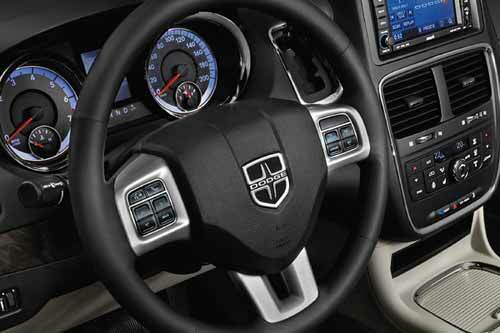 Everyone inside the Dodge Grand Caravan will enjoy the Three-Zone Automatic Temperature Control feature. It creates separate temperature zones for the driver, front passenger and rear passengers to set the heat or air conditioning to match their own comfort levels. Simply set your zone to the exact temperature you want, and the Automatic Temperature Control maintains it through the hottest summers and coldest winters. The Grand Caravan comes with an available Radio 430N Multimedia Centre that is controlled by the 6.5-inch colour touchscreen. It comes with every possible way of accessing your favourite music, radio, and podcast media: AM/FM radio, CD/DVD player with MP3/WMA playback capability, Bluetooth connectivity with your smartphone, and auxiliary input jack. The Multimedia Centre also includes features such as the ParkView® Rear Back-Up Camera, Garmin® Navigation and 28 GB of hard drive space. 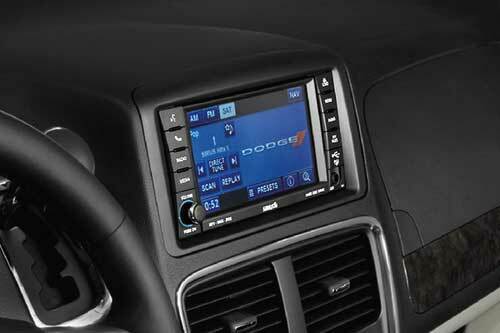 The Grand Caravan makes it safer and easier to operate the Multimedia Centre and its many entertainment options. That way you can stay connected while remaining focused on the road for greater peace-of-mind. Thanks to the hands-free communication functionality and Bluetooth® connectivity with voice command, you can start, stop, and adjust your music stream or phone calls without taking your hands of the steering wheel or your eyes off the road. This innovative hands-free feature can also read and respond to your text messages to you and respond using voice to text and select pre-programmed responses." Keeping passengers entertained, such as your children, is an important element of safe and comfortable travel during your travels. With the Grand Caravan, you get available DVD entertainment system with a 2nd-row, 9-inch flip-down screen that comes with a 115-volt power outlet, remote control, and flat-storing wireless headphones. 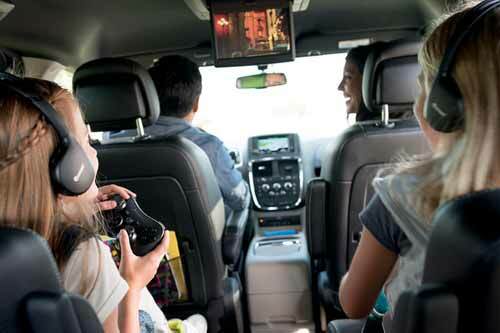 Your passengers will never be more entertained on your road trips, and it even has an HDMI input to connect to video game consoles. If you want access to more radio stations, you can take advantage of the SiriusXM satellite radio with one-year subscription. 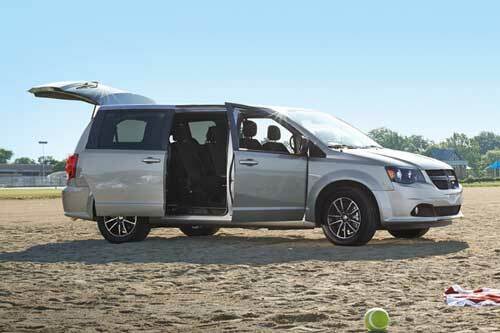 It comes standard on Crew Plus and GT, and available on every other Grand Caravan model. It features up to 120 channels of commercial-free music, and the best in sports, talk, children’s programming and news, including plenty of Canadian content. On select systems, you can set up alerts for your favourite artists, songs and sports teams and use the replay feature to go back and listen to your favourites whenever you want. The Dodge Grand Caravan offers a level of performance beyond what you expect, thanks to its award winning engine and intelligent fuel-saving features. When you drive a family vehicle loaded with kids and cargo, you want a vehicle that can still get up to speed, tow your trailer, and not kill your bank account at the pumps. The Grand Caravan is the only minivan in its class under $26,000 that comes with a fuel economizer feature. It adjusts the engine timing and transmission shift points to optimize fuel economy to make sure you get more value out of your vehicle. 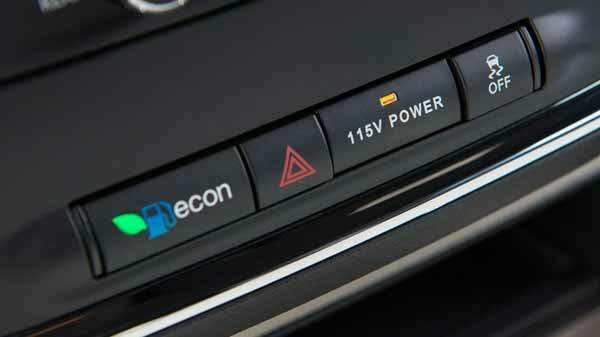 All you have to do to activate the feature is press the “ECON” button on your centre console controls. 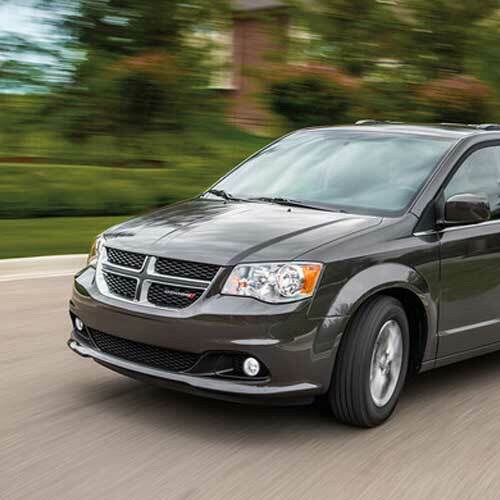 The 17-inch all-season tires that come with your Grand Caravan are made with a low rolling resistance feature. 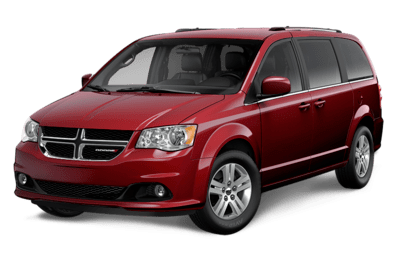 This allows the tires to roll more easily down the road so the Dodge Grand Caravan doesn’t have use as much fuel as you drive. It accomplishes this thanks to a combination of the latest in tire materials and design. The Grand Caravan has your peace of mind covered with several important and advanced safety features. It combines the latest in safety technology and engineering to help you drive safely to avoid collisions, and to keep everyone inside as safe as possible if an accident happens. 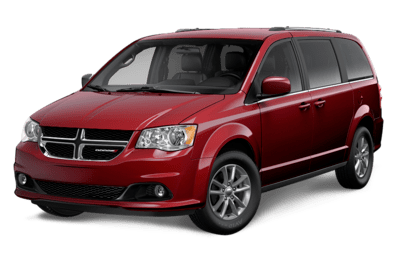 With the safety and security of you and your family in mind, the Dodge Grand Caravan has your back. The Grand Caravan comes with several key structural engineering features to help protect every passenger inside in the event of a collision. It starts with the structure, as it comes with a high-strength steel unibody as the foundation, and specially engineered front and rear crumple zones with safety cage construction to redirect impact energy away from passengers. 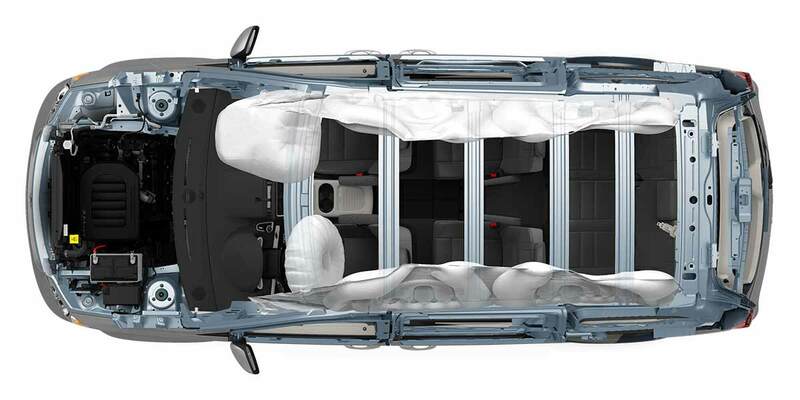 In addition, it comes with seven advanced airbags for the driver and passengers to cushion them from serious damage. It also comes with active front seat head restraints that help reduce the risk of head, neck and spinal injuries in a rear-end collision. 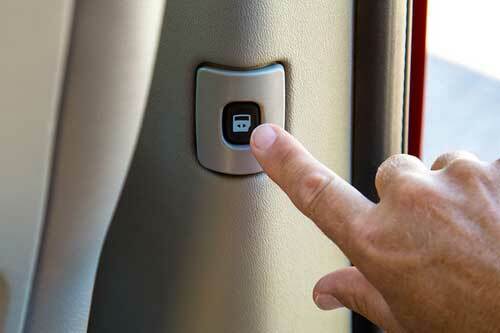 The best safety features help you avoid being in an accident in the first place. 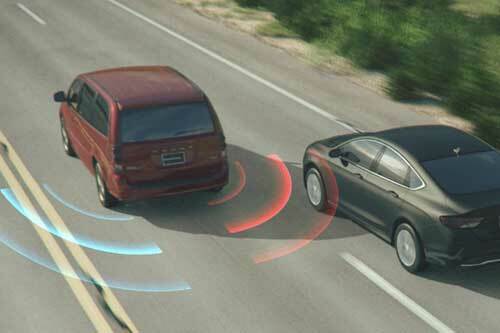 That’s why the Grand Caravan comes with an available Blind-Spot Monitoring system. It is constantly monitoring your blind spots on either side of the vehicle while you are driving, and alerts you when a vehicle enters the blind zones. If you are sticking in your lane, it alerts you with an indicator on your side mirrors. If you activate your turn signal to change lanes, it sounds an alarm to make sure you are aware of the vehicle in your blind spot. 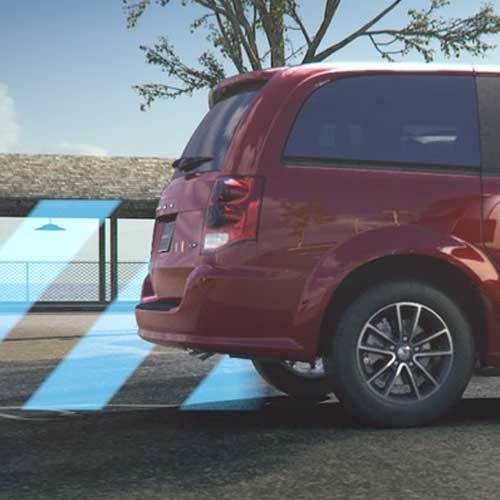 The Grand Caravan also helps you avoid lower-speed crashes as you are backing up to park with two important safety features. First, the standard ParkView® Rear Back-Up Camera engages automatically displays a view of what’s behind the vehicle on the screen of your Multimedia Centre. Second, the available Park-Sense® Rear Park Assist System detects objects in behind you as you are backing up, and alerts you with an alarm that increases in intensity as you get closer crashing into it. No matter what conditions you drive in throughout the year, the Grand Caravan comes with All-Speed Traction Control to help you safely handle even the most difficult roads. It monitors each of your wheels to detect when they start to slip, and automatically applies brake pressure or reduce engine power to safely maintain your traction and stability. Combined with the Electronic Stability Control and antilock braking system, the Grand Caravan is equipped to get you and your family where you want to go safely.